Laser hair reduction is one of most popular treatment at 5th Avenue Medical Clinic. With Light Sheer Diode Laser we are very happy to be able treat any patient and any part of the body. I work for 5th Avenue Medical Clinic as a Laser Protection Adviser to make sure that all safety rules are met, all therapists are qualified and train and to ensure that our patients are safe at all the times. I work as a laser technician since 2006, when I’ve started to use many laser and IPL systems in various skin conditions including hair removal. Since 2016 I’ve started my studies and research in terms of laser hair reduction among different ethnicity patients, I’d presented my results at meetings and conferences, had lectures with students and trained many laser practitioners and science publications. Additionally, I am a Fellow of The Royal Society of Public Health and Member of The Society of Cosmetics Scientists. Lasers are my passion in aesthetics and science. Since 2015 I was very curious in terms of laser application in various skin types patients and their reaction to different lasers in particular in one of most common treatment: pubic hair removal. What is it laser hair removal? Laser hair removal i.e. : selective photo thermolysis when laser beam targets chromatophore – melanin- skin and hair pigment. To achieve permanent hair reduction, the follicle reproductive cells are destroyed alongside the hair itself. Our diode laser – Light Sheer has received FDA clearance for face and body hair removal. It is safe for any skin type including very light and very dark skin types classified I-VI by Fitzpatrick scale. Our therapist – Mila and Elena are qualified and trained in lasers with NVQ 4 level and clinical training. I personally ensure that Mila and Elena follow our local rules for lasers, which has a special treatment license granted by Wandsworth Council. Permanent hair reduction is defined by FDA as the long-term, stable reduction in the number of hairs re-growing after a treatment regime, which may include several sessions. The number of hairs re growing must be stable over time greater than the duration of the complete growth cycle of hair follicles, which varies from four to twelve months according to body location. Permanent hair reduction does not necessarily imply the elimination of all hairs in the treatment area. We consider good results when 60-90 % of hairs are reduced in the area of the treatment. How many treatments I need to have? Everybody reacts differently. We say that minimum of 6 session in 6 weeks intervals for pubic area is required, but I saw brilliant results just after 3 sessions. As laser beam targets hair bulb by hair follicle we know it is not sensation free, but we aim to achieve best results we always cooperate with patient’s sensations during the treatment. Moreover at 5th Avenue Medical Clinic we ensure that treatment room- Laser Controlled Area has specific temperature, treatment settings are correct depending of skin colour, hair colour and hair type to avoid possibility of pain and burn sensation during the treatment. Can I have my hair removed from any part of the body? As mentioned above, patients who decide to do pubic area hair removal more often choose the methods which give permanent results. With Light Sheer – diode laser we can remove face and body hairs but not eyebrows or eyelashes! What results can we achieve? From point of view in terms of literature and studies it has been repeatedly described in the publications, but me and my colleague’s made first attempt in terms on pubic hair removal in multicultural adults and Scientific publications show results limited by photo type/ area/ population/ gender. Our studies aim was to show the multicultural aspect of the effectiveness of laser hair removal by diode laser (805 mn – Light Sheer) in pubic area in a group of men and women from different ethnic background. Our first study was conducted in Poland and the UK among 140 male and female participants of various ethnicities and skin types I-VI. The study shows the impact of photo type and patients ethnicity (3 generations back) on the efficacy of the chosen method of hair removal in pubic. Additionally, results shows effectiveness of diode laser (805 nm) hair removal in pubic regarding to the gender. Study results shows that the percentage of hair loss correlates statistically significantly inversely with photo type according to Fitzpatrick scale. 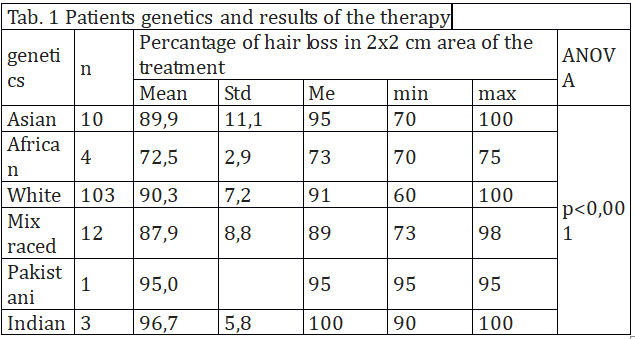 With decreasing values ​​of these variables significantly increased the percentage of hair loss. Our study proves that 805 nm Diode Laser- Light Sheer treatment is effective in any skin type pubic area regardless patient gender. With excellent results – min 72,5% hair reduction in African patients to 96,7% hair reduction in Indian patients. 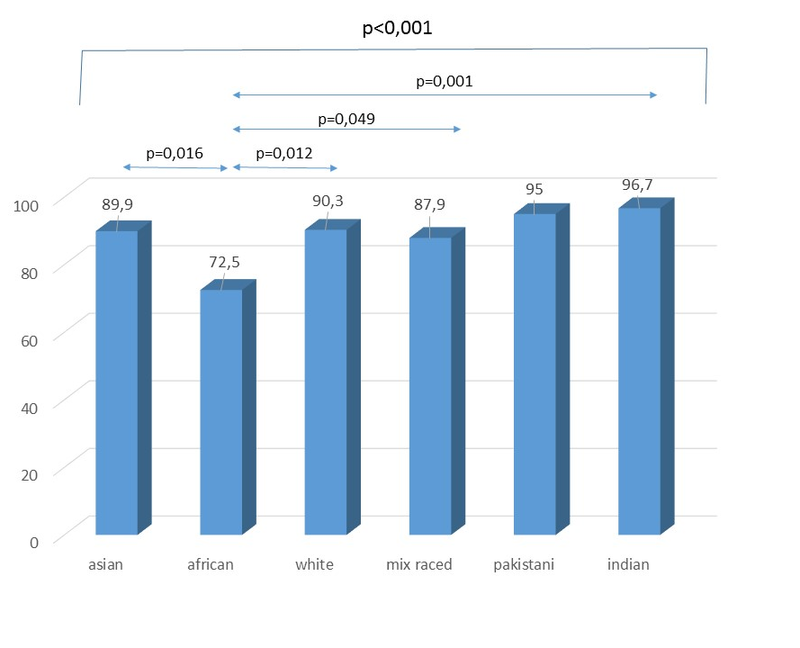 Figure 1 Percentage of hair loss in different ethnicities of patients. Has graduated BSc in 2002, and MSc in Public Health from Jagiellonian University of Krakow in 2004. In meantime graduated from European School of Cosmetology in Cracow in 2003 as a Technician. Worked in various clinics in Poland and UK as a Laser Practitioner. Has a passion for lasers and expertise in laser use in various skin conditions in aesthetics and science. Fellow of Royal Society of Public Health and Member of Society of Cosmetics Scientists. Author of over 10 scientific publications, professional training materials and lectures for therapists.